Occasionally, time gets away from us all. Especially when you have a calendar full of important meetings and a month seems to disappear as fast as it came. Before you know it, it’s time for your next board meeting. Being reminded of yet another meeting you don’t feel prepared for is probably not why you joined a board. What is more likely is that you joined to help your community and its businesses, or to assist a charitable cause you’re passionate about. How can you give yourself more time and space to remember that reason you joined in the first place? A board portal can help streamline a lot of the necessary, but time-consuming, tasks that go along with sitting on a board. With a board portal, all you need to do to get caught up for your upcoming meeting is log in (or use Face or Touch ID!) to your portal. Your BoardPaq administrator uploads the agenda, minutes, and documents needed into the board portal. You’ll be notified when materials are available for you to review, so you can do it on your own time. Using a paperless board portal like BoardPaq eliminates the issue of losing important documents. Instead, finding a document is as simple as clicking on the meeting you’re preparing for. You won’t have to carry around a large binder or packet and worry about accidentally leaving it at home. As long as you have your phone, tablet, or laptop, you’ll be prepared. If you’re looking for a document regarding the organization, instead of a specific meeting, you can go to the Library feature where important documents like Bylaws are kept for easy access. If you’re ever having trouble locating something, you can easily message your Board’s Chair with BoardPaq’s in-portal discussion tool. If you’ve ever attended a Board meeting, committee meeting, or any formal gathering that included an agenda, you know how distracting it can be when someone can’t locate their copy of the document your group is reviewing. The rustling of papers can be distracting for other members, and if you’re the person whose document is missing, it’s even harder for you to contribute to the discussion. BoardPaq’s Side by Side Display solves this issue. It uses a shared-screen technology that allows members of the meeting to easily follow along and open supporting documents—all while never losing sight of the agenda. This allows you to see how far into the meeting you are or what’s coming next. A board portal also makes a usually difficult task— in-meeting voting, an easy one. The stress of taking a formal vote during a meeting are no longer worries by voting through your secure, confidential portal. BoardPaq’s voting function tracks and automatically records each person’s vote, making voting quick and easy, saving more time for other important discussions on the agenda. Utilizing BoardPaq’s task function allows you to be fully present in meeting discussions. You’ll no longer need to frantically take handwritten notes during discussions, only to leave the meeting trying to recall what you volunteered for. The task function allows the BoardPaq administrator to assign tasks to you that were discussed in the meeting. Once you’re assigned a task, you’ll get a notification in your portal reminding you of it. Once you’ve finished it, you can virtually check it off, and the task will no longer be in your queue. You’ll also automatically get an email notification when your Board Chair or administrator completes a draft of the meeting minutes. You can easily log in to your portal to review and comment so the minutes can be finalized for the next meeting. BoardPaq is completely secure and all your documents will stay in the same, easy-to-find, place — unlike paper mailing or emailing, where important information can easily get lost or sent to the wrong person. Automatically being able to download meeting documents in a secure portal saves you time — time that could be spent more efficiently at work, or evenings that could be spent with your family instead. 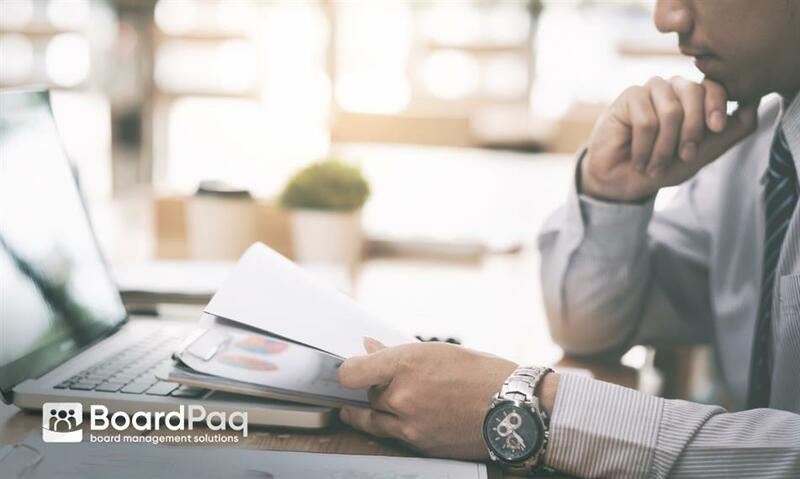 If you’d like to see for yourself how BoardPaq can ease the stress of meeting preparation, and improve your productivity during and after meetings, schedule a demo here. Allix Beckmann is a professional writer based in St. Louis, MO. Allix holds a Master of Arts degree in Nonprofit Administration, and has served as a project & marketing manager for several organizations. She provides copywriting, social media marketing, and content writing to a variety of businesses, nonprofit organizations, and social enterprises.